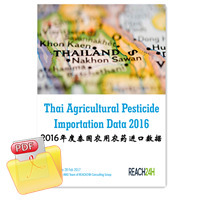 By the end of 2016, Thailand agricultural pesticide importation totaled to 160,687 tons, representing an increase of 10.8% compared with the previous year of 149,458 tons. Import value grew by 7.1% to 20.577 billion THB (587.91 million USD at the current rate). The number of Thai companies engaged in pesticide importation decreased from 147 to 141 while the number of sourcing origins went from 34 in 2015 to 36 in 2016. The number of imported active ingredients/combinations varied little, but prices were volatile during the year. This report contains the statistic of the volume, value of the 250+ imported active ingredients/combinations and over 440 formulations, as well as the performance of origin countries/region.